A couple of things to note about this week’s comic. Firstly, this is a true story, just not one that originally starred Aileen. This was a story told to us by our friend Emer, who walked in on her partner Chris trying to set up Euphoria and having a full-blown argument with poor Rodney from Watch it Played. So thanks to Chris and Emer for allowing us to steal this for a comic. Secondly, this is not meant in any way as a criticism of Rodney or Watch it Played – we just thought an angry reaction was such a stark counterpoint to Rodney’s genial, friendly, practically soothing manner that it was too funny not to go with. So calming are the video presentations of Rodney, in fact, that I have been known to put them on before bed just to unwind. Sometimes I dream of meeples. Thirdly, a big thank you goes out to Rodney himself for allowing us to feature him in today’s comic. He is as good a sport and as good humoured as his videos would suggest. And if you aren’t using his videos to help you learn the rules of your board games, then frankly, you’re doing it wrong. I’m generally good with rules, and I am our group’s go-to rules person, but sometimes you just need to see a game set-up and played to get a handle on it, and that’s exactly what Rodney does. A little over a week ago there was a great article from Geek and Sundry going around – ‘4 Women in Tabletop You Need to Know’. If you haven’t come across it yet, give it a read. Even better is the fact that, by now, the comments section of the article is full of further recommendations of great women in gaming that you can follow. So it is that, for the first time in my life, I am making a recommendation to read the comments. ‘3 Actionable Ways to Make Gaming Culture Safer’. Please, please, please give this article a read, and be the person that makes these changes in your community, store, group, company, whatever. Don’t just think about these things: take action. Make gaming the welcoming hobby we all want it to be. I love gaming and I love the community, and I want everyone to have the same positive experiences that I have had. I want everyone to have a table where they can feel welcome, and it is entirely in the hands of everyone already in this hobby to ensure this happens. I liked UvulaBob for rules explanations, but he seems to have vanished off the face of the earth 4 years ago. Never heard of them at all, but then we weren’t that much into gaming four years ago. We were a bit, just nowhere near our current level/obsession. To be fair, though, his tutorials are immensely helpful, it just requires pausing and rewind to keep up with his smooth editing. Oh god, it’s set-ups like Euphoria that make me want to run and hide. I think they’d be interesting to play, but considering the audience I’m usually explaining games to, I can see their eyes glazing over before the game even starts. We haven’t even set up Guards! Guards! yet, for similar reasons. With regard to Teri’s article, I think we’re reasonably lucky in that the board gaming culture here is very much an inclusive environment. What I think can fall down is the spaces in which games are played. I’ve seen a fair number of game stores get it right, but far more get it terribly wrong. The first steps can be intimidating in breaching the social construct in a local game store, and that can be made all the worse when it’s a male dominated environment most days (or so I’ve noticed as war games tend to attract that demographic, and also tend to be most prominently on display). I think a lot of stores need to take an objective look at how welcoming the atmosphere of a store can be to a new patron, lest they quickly decide the entire hobby is not for them (first impressions can often be of these stores, rather than the games within). That atmosphere is partially in the store layout/decor. Cluttered and disorganised feels synonymous with dark and dingy, and can give a general feeling of unease to people new to the store and hobby. That atmosphere is also underpinned by the attitudes of the patrons and staff. Generally, gaming store staff are lovely people, but sometimes the patrons can leave something to be desired; usually some respect and self restraint when it comes to women in the store. I’ve seen the leary type Teri mentioned first hand several times, and I’ve literally seen a store fall almost quiet when walking in with some friends who happened to not be guys. That instantly felt both uncomfortable and embarrassing for us. I feel it’s massively important for us all to work on it though. Among my friends, it’s about a 50/50 split of folks playing tabletop games of various types, but it’s 99% male attending stores to do same. You are absolutely spot-on here. The culture I have experienced locally is great, and while the different groups I game with are not a 50/50 split, there is a good mix of male/female players. But while playing in any store, or organised, competitive play the ratio goes down the toilet. I have walked into games stores in my time where I wouldn’t be enthusiastic about joining the patrons, and I AM a beardy white guy. 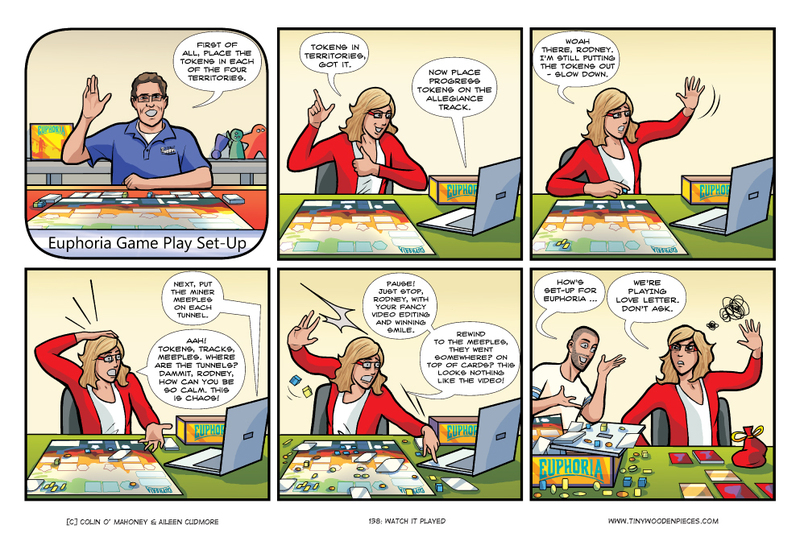 I was actually talking to Chris from Tabletop Cork about this earlier on today: there is typically about a 50/50 gender split in the pop-up, which is super-important, because it is so much more difficult to try and introduce diversity into a situation that has lacked it historically. So by starting off on the right foot they are ensuring it will be easy to continue that way. A store that has always had a male-centric customer base if going to find that it takes real effort to change that: like you said, it would require an objective look at their whole set-up. I’ve had similar experiences walking into game stores. Many of them have a very established customer bases that can sometimes seem intimidating to broach on gaming days of various kinds. It’s tough to break into a group of 10 or 20 people who all know each other, and start playing with/alongside them. It’s infinitely harder if that group is entirely male, and you’re not. Tabletop war games are often the biggest culprit. At Nationals, X-wing had a single woman playing and Armada had none. Meanwhile Netrunner had about a 75/25 split, and better for some other games. Not sure what that necessarily says about the community for the game, but it struck me as interesting while there. I agree that the personality of the shop, as lead by the owner and staff, is super important. You can sense the difference between the stores that dourly see themselves as the gatekeepers to their hobby (keeping the unworthy out) vs those who actively try to encourage novices to join in the fun. Our local shop, which I just discovered, is so friendly and welcoming, I almost feel pressure to be a nicer/better person when I visit — which, you know, is a nice thing.